With so many new wearable fitness devices, new features, and different brands, it can be a bit challenging to find the right fitness tracker fit for you. And with the price tag on some of these devices, it’s a choice you can’t always afford to get wrong. Smart watches and fitness trackers have really stepped up their game with the release of the Apple Watch Series 3 and Fitbit Ionic. Let’s take a closer look at some of the pros and cons of each product and see what best fits your needs and lifestyle. Pros: You have an option of selecting the GPS option or the GPS with Cellular/LTE option. An improvement over the previous versions of the Apple Watch, the Series 3 with Cellular allows you to take calls and send messages even if you’re away from your phone. Basically, it can replace your phone for those essential tasks. Both versions include streaming music, chatting with Siri, and tracking your fitness. 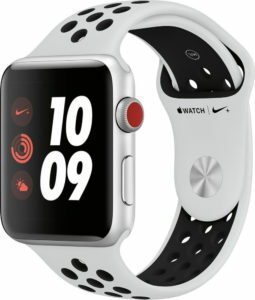 The fitness features include a heart rate monitor, a waterproof design, GPS, and activity tracking. Cons: Battery life can suffer when utilizing the GPS and cellular features. And if you’re not already an iPhone user, you may need to replace your phone for an iPhone as the Apple Watch only syncs with iPhones. Also, if you get the Series 3 with cellular, most cell phone carriers charge an extra monthly fee to add another device to your phone plan, so beware of an increase in your monthly bill. If you’re looking for a smart watch and don’t have an iPhone or the extra cash, the Series 3 may not be the choice for you. Pros: The Ionic is Fitbit’s upgraded smart watch while still offering at its core, a powerhouse fitness tracker. With a comfortable design, water resistance, and GPS, it’s an ideal smart watch for an active lifestyle AND you’ll only have to charge it once or twice a week. Cons: Unlike the Apple Watch, the Ionic doesn’t have very many apps available yet. More should be coming soon, but you are left without the features of other similar smart watches. The Ionic also must be paired with a phone to take calls and texts; there is no cellular-only feature. The look is also very fitness focused; the band is not a sophisticated look that you would expect to get for $300+. Overall, the choice comes down to how you intend to utilize your smart watch, how much you want to spend, and whether you have an iPhone. The Fitbit Ionic is compatible with Android and iOS, has key features such as GPS, fitness tracking, and mobile pay, and has music play back, which puts its features on a similar level as the Apple Watch. But the Ionic, with its strong fitness function, lacks the functionality of the Apple Watch Series 3’s apps and cellular option. If you’re a Android user, there’s a clear winner in the Fitbit Ionic, but for those on iOS it comes down to lifestyle and budget to decide. Do you own one of these products? If so, what is your favorite feature? 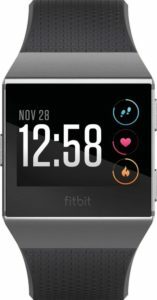 Fitbit’s entry into the smartwatch market with the new Ionic tends to be discussed only in the context of the Apple Watch Series 3. This is really too bad, as the Ionic is a great device that offers different things than the Apple Watch.